The Instant Pot has been working well for me that it’s now my personal mission to go back to my favorite recipes and check if I can cook them in a more efficient way. 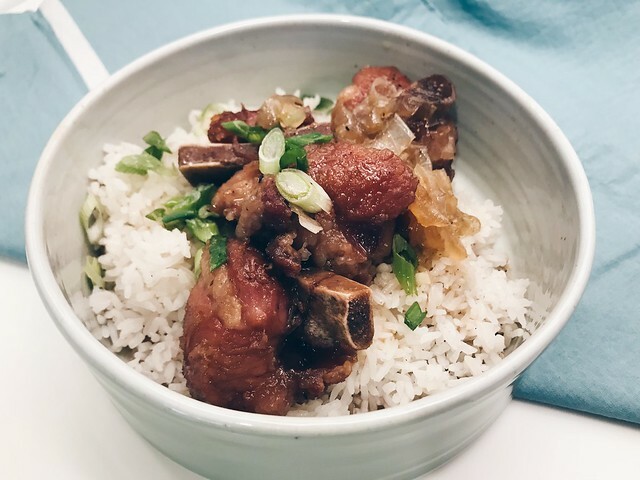 I found some rib tips at my grocery store and I thought they would work well and cook faster for this recipe. I think if they were boneless, they would be less challenging to eat, but no one said you can’t use your fingers to eat these. If you can get a sweet Vidalia onion, it would be nice; a regular white onion will do, but Vidalias have a sweetness to them that would nicely hold the fat back from becoming too overwhelming here. 1. Using the sauté function of your Instant Pot, add 1 cup of the sugar. As soon as it melts and turns golden, add pork, raise heat to maximum, and stir until coated. The sugar will harden, but it will re-melt as it becomes a sauce. 2. Add the remaining sugar and the fish sauce. Season with salt and pepper. Mix well. Cover and lock the lid properly. Select the Pressure Cook function for 20 minutes. When it’s done, do a quick release after venting and letting the steam out. 3. Stir in the garlic and a dash of sesame oil, and turn back to the lowest setting of the sauté function to reduce the sauce. Add the onions and keep mixing until they’re translucent. Pork should be caramelized and the sauce thickened. Transfer to a bowl with white rice and sprinkle with scallions.